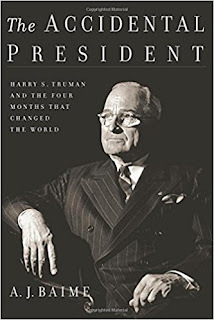 I like Harry Truman, so I was pleased to hear about a new book, The Accidental President by A. J. Baime, a great story focusing primarily on the four months between his rise to the presidency and the end of the war. His earlier life is covered, with particular attention to his brief tenure as vice president. He served as an artillery captain in World War I. Before going to France, he and Eddie Jacobson, “a fine Jewish boy,” organized their battery’s canteen, or supply shop. They did a booming business, which gave him the opportunity to test for the captaincy. In France, he took charge of Battery D of the 129th Field Artillery, the most incorrigible unit in the service. Other commanders had failed to bring the men into line. Harry let them know he was the boss and never had trouble with them. After the war, in November of 1919, he and Eddie opened a haberdashery. Then a recession hit. By the spring of 1922, they were out of business. It took Harry years to pay off his debts. Harry had served in the war with Jim Pendergast. Jim’s father, Mike, and uncle, Tom, ran the Kansas City Democratic political machine, and Mike suggested Harry run for county judge. Harry did, and won. The county judges controlled the salaries of municipal employees, and typically got kickbacks, but not Harry. Honesty was the major plank of his platform. When the Pendergasts suggested he run for senator, he agreed. The Pendergast machine got him elected, and many senators refused to speak to “the Senator from Pendergast.” The boss did ask him to vote certain ways, which Harry did on inconsequential matters, but he always sided with FDR. “Back Roosevelt” had been his campaign slogan. After Harry was nominated to be vice president in 1944, he realized when he met with the obviously ailing FDR that he would not remain the vice president for long. When he campaigned for Roosevelt’s fourth term, he said, “Ask yourself if you want a man with no experience to sit at the peace table with Churchill, Stalin, and Chiang Kai-shek.” Ironically, he would be that inexperienced man. 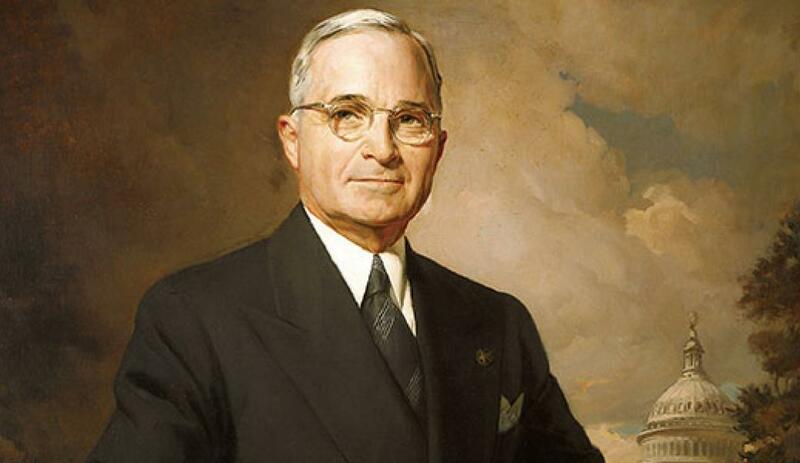 Truman’s style is contrasted with FDR’s. He came into the presidency totally unprepared, but I suspect he did a better job than Roosevelt would have. Roosevelt was too willing to acquiesce to Stalin, whereas Truman stood firm. One huge difference between Truman and his predecessor was how they dealt with their cabinets. Roosevelt enjoyed causing discord among the cabinet members and watching them bicker. How can you efficiently run a government that way? Truman surrounded himself with a team that would work together. He didn’t ramble on at meetings as FDR had, but got to the point and moved on, to the astonishment of the cabinet members. Truman didn’t have the formal education expected of a president, but he was widely read, and his very ordinariness is what made him great. 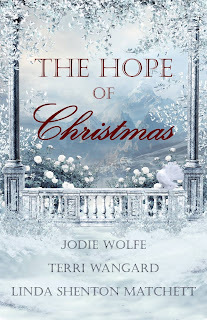 My short story, “Typhoon Prompting,” part of The Hope of Christmas, takes place during Typhoon Cobra. The navy’s Pacific combat fleet was caught in a storm that capsized three destroyers. One of them, the Spence, was featured in Wheresoever They May Be. 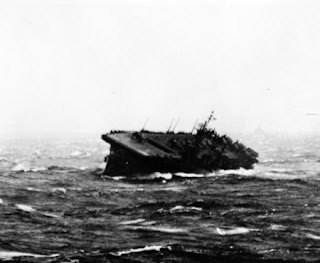 Among the ships battling the storm was the Monterey, a light aircraft carrier. Among the Monterey’s crew was a young lieutenant, Gerald R. Ford. 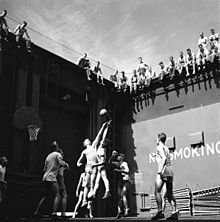 Gerald Ford, the jumper on the left, plays basketball on the Monterey's hangar deck. Ford was one of ten gunnery officers and also served as the ship’s athletic director. During the typhoon, the ship rolled twenty-five degrees, causing him to fall and slide the full width of the flight deck. He managed to catch the two-inch metal rim around the deck with his foot, breaking his momentum and allowing him to land on the narrow catwalk just below the deck. The airplanes on the Monterey’s flight deck broke loose as the ship pitched and heaved, and were swept overboard. Planes on the hangar deck crashed into each other. Fire broke out. The men raced to drag bombs and torpedoes out of harm’s way and dump them overboard. Smoke funneled into the engine and boiler rooms, forcing crewmen to flee or be asphyxiated. Three of four boilers stopped, and the ship was in danger of losing power. The USS Monterey rolls in the typhoon. Admiral Halsey ordered them to abandon ship, and ordered nearby cruisers and destroyers to pick up survivors, no easy task in a typhoon. The men of Monterey fought the fires for forty minutes and saved their ship. Three men died, forty were injured, ten critically, and all their planes were lost. One of the survivors was Gerald Ford. Had he gone overboard, it is extremely doubtful we would have had a President Ford. In my role as a genre coordinator in the ACFW First Impressions contest, I check judges’ comments to make sure they don’t promote their own books or make disparaging comments. One comment caught my eye. The entrant used too many big words. Try writing at the fourth grade level. Do you know what “opine” means? I wrestled with that all weekend. I like the word. Otherwise I wouldn’t have used it. But the judge’s remark kept coming back to me. Readers don’t want to hold a book in one hand and a dictionary in the other. What to do? Early Monday morning, before submitting my edited manuscript, I listened to the judge and changed the word. 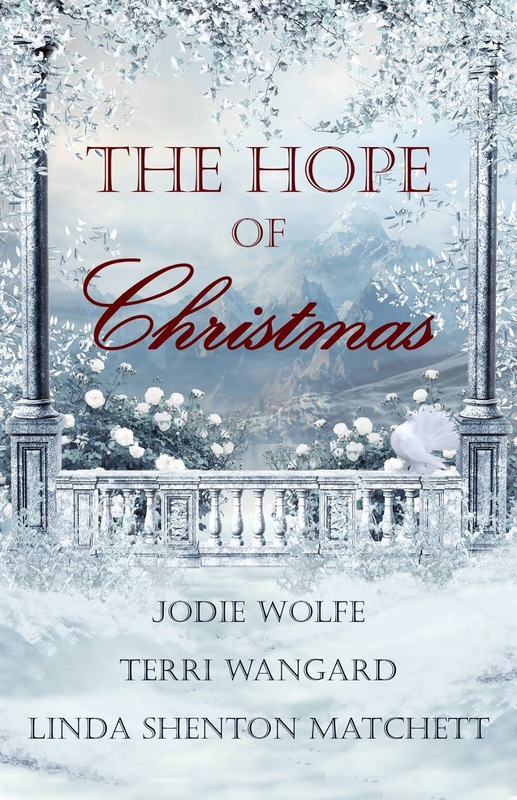 The Hope of Christmas is now available for pre-order. Included are a prairie mail-order bride story, a WWII American woman doctor in London, and my offering, “Typhoon Prompting.” A character from Wheresoever They May Be shows up. Care to guess who? I’ll give you a hint. Who suffered a bad case of sunburn? Did everyone remember to turn back the clocks on Saturday night or first thing Sunday morning? Do you like this exercise in futility? I mean, really, where’s the savings? You may not have to turn on a light in the morning, depending on what time you wake, but you’ll have to turn on the lights on hour earlier in the evening. 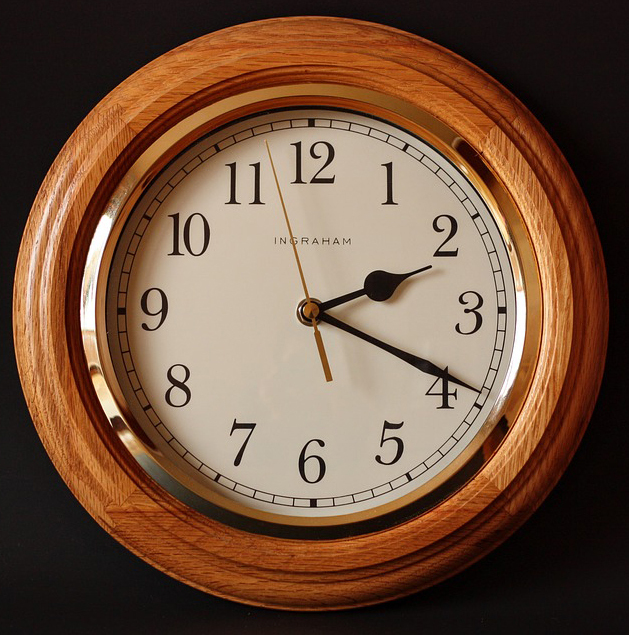 Daylight-saving time was imposed by the federal government during World War I with the notion it would conserve fuel. Hostility led to the measure’s repeal after the war. The federal government gave the states the option of continuing the time change if they wanted. The majority of Wisconsinites didn’t want to. Farmers, especially, didn’t appreciate the havoc it caused with cow-milking and field work. City folk were more in favor of it. Milwaukee tested of version of “fast time,” and the state legislature made it illegal to use anything but Central Standard Time. Some businesses changed their own clocks in 1930, and the following year, punishments were enacted. A businessman could go to jail for 30 days and have to pay a $50 fine. “War time” came back with World War II. After the war, neighboring states allowed daylight-saving time, and many business groups pushed for Wisconsin to join them. Not until 1957 was the change adopted through a statewide referendum. So the clocks have been changed. But it still doesn’t change the number of hours of daylight. 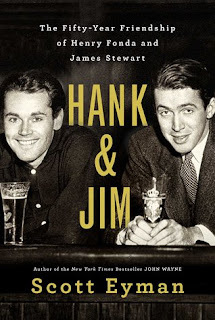 I read a new book called Hank and Jim: The Fifty-Year Friendship of Henry Fonda and James Stewart, by Scott Eyman. What an interesting book! Hank and Jim offers a fascinating look at two long-gone screen icons.